This will work well with my Blichmann beer gun. Now I will be able to hook it directly to the faucet rather than messing around with changing lines inside the fridge. I have a beer gun and occasionally bottle some of my beer. to use beer gun from tap to bottle. figured it work nicely with the last straw. Hoping for an easy filling process right from my flow control taps. I want to try using it to fill bottles. What size threads does this have? BEST ANSWER: These are typically a proprietary machine thread, designed only to be used with their products. 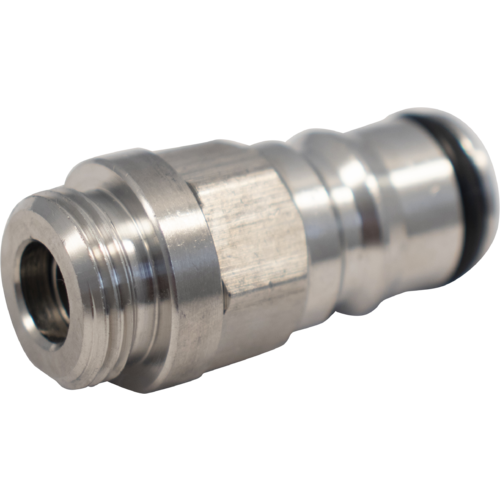 I emailed Intertap asking for thread info, and they responded saying that it is 3/8” thread. Nothing about thread pitch or compatible thread standards; pretty useless info. From what I’ve determined it is custom, and I haven’t found anything compatible with it (other than the tap body...). 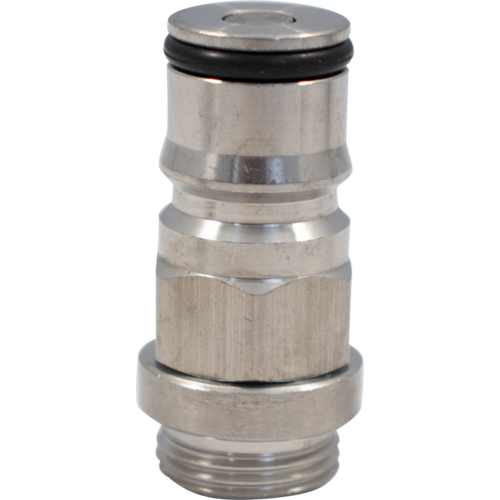 British BSP 3/8"-19 is the Intertap thread size for the spouts. This attachment fits perfectly on my intertap faucets. Great for filling cans using a picnic tap or a beer straw. I admit I rarely use it but like all brewing/beer equipment it's good to have on hand. Worked well for the transfer from one keg to another, but it came apart when I unscrewed it is and I can’t overcome the spring to put it back together. So I’ll have to order another and try not to tighten it so much. Good product. 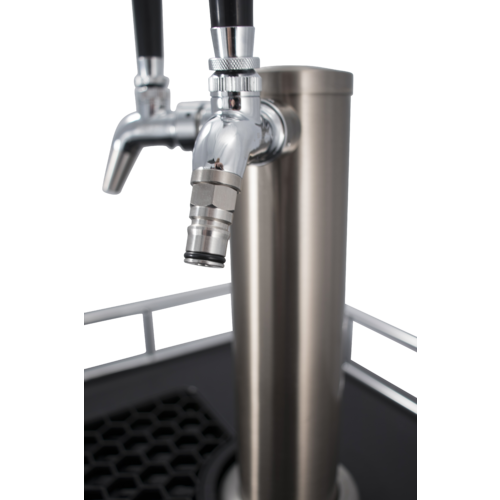 With the length of line connecting the keg to the tap and a long line from the tap to the beergun, I don't have to turn down the pressure on the keg at all to bottle and have very little foaming. I'm not sure what this is for but it will not hold 4psi of pressure without leaking all over the place. I had hoped to use it to connect a beer gun for bottling. It's not useful for that. It was leaking when I was just trying to pass some PBW and sanitizer through it. No way would I use it to bottle my beers I'm bottling for competition. Look close at the design. When it wasn't working I tried tightening it down with a wrench because it has a hex on the base, except below that is a round piece with no flats. So when I attempted to remove it, since it wasn't going to work, just the end came off and the bottom part was still on the faucet. Had to use channel locks to get that part off. Just poorly thought out all the way around. Did you add a gasket? I purchased the hose barb option for my Intertap and the same thing happened. After I added a gasket like the one that came with the original tap fitting it worked great. I really wish the additional attachments would come with their own gaskets. Works great to bottle beer with a Blichmann Beer Gun. 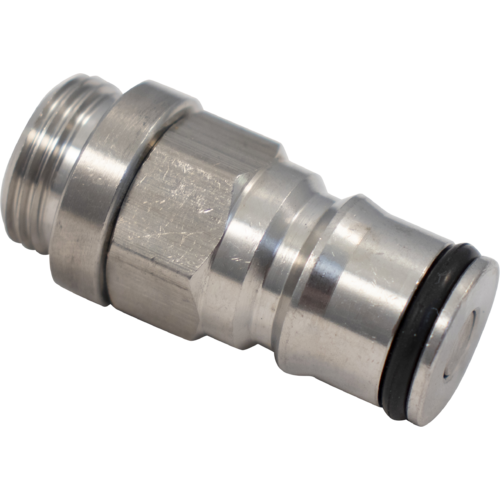 Used this ball lock with the Intertap Forward Sealing Stainless Flow Control Faucet and a Blichman Beer Gun too bottle beer. Work great!